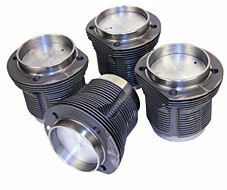 Home > Engine Longblock > Piston Kits and Barrel Only Kits Low Prices !!!!! Piston kits are available in 83mm (40 horse big bore), 85.5 (1600cc) , 87 (1641cc), 88 (1684cc), 90.5, 92, & 94mm. They come in "A" Stroke (69 thru 76mm cranks) and "B" Stroke (78mm and Larger Cranks). 87mm are slip in (85.5 bore), 88mm come in slip-in (no machine work) and 88 Thick Wall with machine on the Head side (90.5/92) and case side is slip in. 90.5 and larger kits require maching on Heads and Case. 92mm Thick Walls come 2 different ways. 92-Thick is 94mm on Top and Bottom of Cylinder, 92-Thick-Step are 92 at case side and 94 on Cylinder Head side (Thick Top). Also under product options Barrels Only and extra long 94mm Barrels only. Kits are AA unless specified Mahle in the drop down when choosing your kit. Call if you have any questions.... We can help. Click Product Options tab to choose the ones you are looking for.